Malaysia’s finance minister Lim Guan Eng will present the 2019 budget to the parliament on 2 November - the first budget of the new Pakatan Harapan [Alliance of Hope] government. The Mid-term review of the 11th Malaysia Plan 2016-2020 unveiled by Prime Minister Mahathir earlier this month sets a clear tone for the upcoming budget - a deferred fiscal consolidation. Sweeping policy changes under the government’s drive to improve peoples’ standard of living and clean the corrupt political machinery have strained public finances. The revenue loss from consumer tax reforms is unlikely to be pared by savings from suspending development projects undertaken by the previous government. This comes as overall economic performance continues to weaken and thereby depress government revenue. These factors are likely to push the budget deficit above 3% of GDP in the current year, marking an end to the decade-long fiscal consolidation trend. The tighter policy stance combined with sustained external risk suggests Malaysia’s GDP growth will remain under pressure in 2019, more likely staying close to the low end of 4.5-5.5% target. And with the pressure to trim public debt, estimated over MYR 1 trillion (80% of GDP), getting the fiscal situation under control will be a challenging task in the near-term. We expect only a slight reduction in the deficit to 3.1% of GDP in 2019. The downside risk to our budget deficit forecasts stems from a significant reduction in development spending, though that also means a greater downside GDP growth risk. Hopes also rest on higher oil price providing positive terms of trade shock to Malaysia's net oil exporting economy. Higher oil price will not only soften the impact of the global trade war, but it also will increase the petroleum revenue to the government. However, it also means higher government expenditure on fuel subsidies to the public. 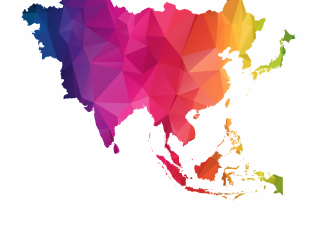 Elsewhere in Asia, the week is packed with October economic data on trade, manufacturing, and inflation, which will provide a sense on the region’s performance coming into the final quarter of the year. China’s PMI will be released this week and will be closely watched for what they say about the trade war impact, though the seasonal slack in activity due to the Golden Week holiday distorts the picture. We expect the manufacturing index to drop 50.3 in October from 50.8 in September. 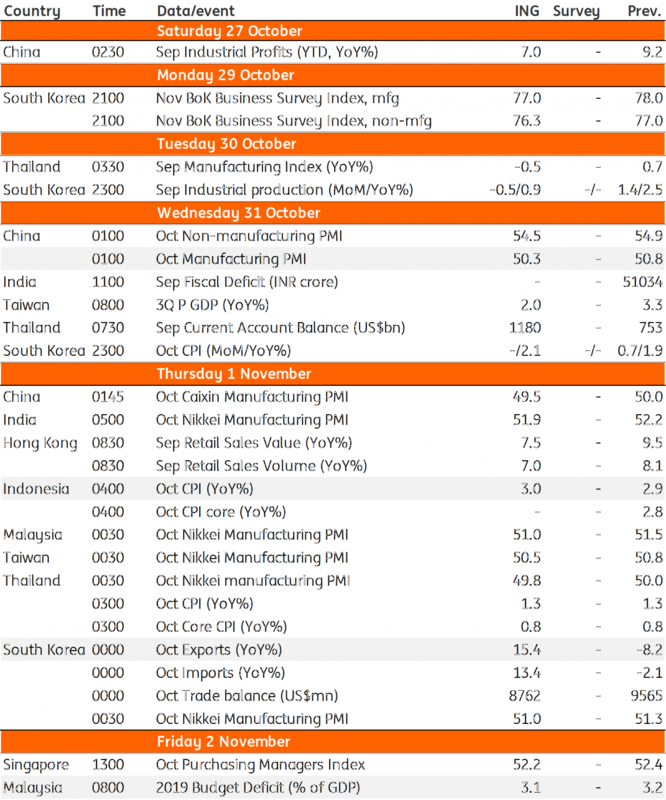 The manufacturing PMI’s from the rest of Asia are expected to show some softness as well. Korea’s October exports, the first export data for the month from Asia (and probably from the world), will also be pursued for the trade war impact. Don’t be misled by our strong, 15% year-on-year export growth forecast. It’s merely a hope of some clawback of the weakness in the previous two months, while the positive base effects boost the year-on-year growth print. Korea has been a leading Asian economy in export slowdown this year, prompting yet another cut to the central bank’s growth outlook for this and next year. Indonesia's CPI release is an important one from the central bank's policy perspective after their decision this week to pause tightening. We don’t think a slight uptick in inflation to 3% from 2.9% will be a big deal. With currency stability remaining the key policy driver, we don’t think their tightening cycle is over just yet. We have pencilled in one more 25bp policy rate hike before the end of the year.